The EasyPS/2 Board enables your development board to be connected to a PS/2 device. There is an on-board PS/2 connector used to establish PS/2 communication. The board also features a DIP switch used to configure board connections. 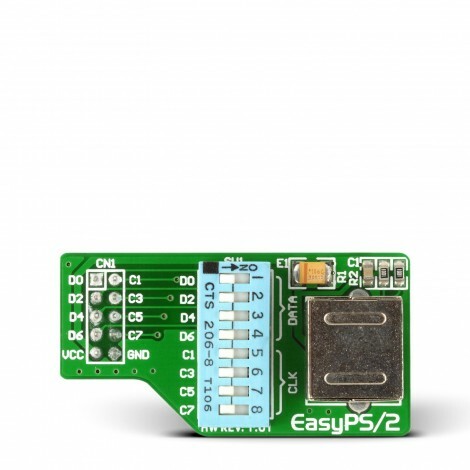 EasyPS/2 board is a great way to add PS/2 connectivity to your prototype, development board or final device. It features standard PS/2 connector in metal shield and female IDC10 header compatible with mikroElektronika development boards. Additional DIP switches enable you to select DATA and CLOCK lines that match your target application. Board is clearly marked which helps facilitate connections.